A Bible of People, Places and Things. Also a possible spoiler zone. 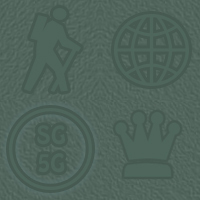 >> P4X-650: the third Alpha Site on which the members of six SG teams were killed or went missing. >> P7X-259: the fourth Alpha Site, home of New Washington, a.k.a. Washington PX. >> Houses the alpha site Stargate. Maxine Pepperday has an office suite there - Room 423. They take over other worlds by supplanting the real leaders whom they then sell as slaves. Much of their knowledge has come from the Dark Furlings or Dwimmerlings and some from the Ancients in the Elder Days. They have ships, usually hijacked, including some from the goa'uld in more recent times. This was how they brought the third 'Gate to Earth. >> The Bull-Shitters Club - SG-24's nickname for themselves (and Ash), based on Maxine's belief that it's better to talk one's way out of trouble than to kill someone. >> Military-style police force, moderately corrupt and mostly a law unto itself. >> Only about 4% of the total matter in the universe is visible. Of the rest, about 22% of the other weird stuff is called Dark Matter. The rest is said to consist of the even more bizarre Dark Energy. For those interested in the topic, here's a link to NASA's Joint Dark Energy Mission. >> Dial Home Device. The SGC now uses a spare D.H.D. as all the computers were irreparably damaged. This D.H.D. was found before the Great Disaster on a deserted world. It was retrieved as a potential back-up device and stored in the basement of the SGC whence it was rescued when the base was re-opened. It now stands at the back of the 'Gate Room below the Control Room window. 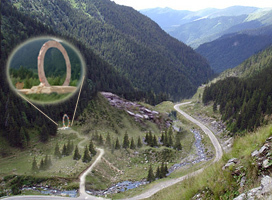 >> The highest part of the Transylvanian Alps in Romania, site of the Bruxan Stargate. >>October 13th 2064. There was a major movement of the Juan de Fuco fault, causing a subduction earthquake under the Cascades which registered a magnitude of 9.6 on the Richter scale. This caused burying of the SGC for several years. It also triggered serious movements of the San Andreas and Hayward Faults, a blind thrust fault on the San Gregorio, plus a minor movement of the Calaveras Fault among others, with many fires and the semi-collapse of the south side of the Golden Gate Bridge which rendered it unusable; likewise the western end of the Bay Bridge. >> Dr. Theodore Jared Hunter, doctor of earth sciences and engineering, son of Waldo and Martha-Bethany Hunter and great-great grandson of Dr. Daniel Jackson. Closet gay lover of Asher Kirkwood. >> Major Tobias 'Toby' King, member of SG-1 before the Great Disaster. >>Captain Giancarlo Giustino 'Luc' Lucarelli, 2IC of SG-24 and mediaeval weapons expert. Son of Marco and Fio Lucarelli. Great-great grandson of Col. Louis Ferretti. A closet Catholic, very much lapsed. >> Major Jefferson 'J' Mitchell, CO of SG-24 and martial arts instructor - mainly jiu-jitsu and karate. Second son of Colonel Buchanan 'Buck' Mitchell and his wife Eleanor. Great-great grandson of Col. Cameron Mitchell of SG-1. >> Lincoln 'Linc' Mitchell, elder brother of Major J Mitchell. >> Madison 'Maddi' Mitchell, younger sister of Major J Mitchell. >> The new Office of National Security in Coloraado Springs. >>Dr. Esther Maxine Pepperday, doctor of cryptology, linguistics, anth. and arch., daughter of Rufus and Kim Pepperday. Great-great granddaughter of Dr. Daniel Jackson. >> P4X-650: the third Alpha Site on which the members of six SG teams were killed or went MIA. >> Café in Colorado Springs popular with SG-24 and Ash. >> Bruxan volunteer intended to replace a person in power or troublemaker. >>The youth branch of the Warriors of Christ.